There are currently 3 users and 1242 guests online. OK all you fly fishing gurus. Ive got a 9wt combo I have had for years and have never been organised enough to learn how to use it. Whats the best way to learn to cast one of these things? Lessons around Perth? Fly fishing looks like another interesting facet of fishing worth a shot, just I dont know where to start. Help Me Please. anyway man best of luck to you!! Agree SWF is fun and you definatly have to be taught properly Tim. You wanting to get some dolly on fly me thinks, pop in and we'll discuss, i'll teach ya! Owner of "Oceanside Tackle & Marine"
Yeah was something I have always had an interest in but never had the time to put into it before. Dollys are one target I wouldnt mind getting Ryan. SBT is another I would love to get as well as just walking the flats chasing smaller fish as well (I can feel a need to buy more combos coming on). Was also thinking it would be good for when I go to Exmouth. Will pop in one day for a chat anyway. Liquidtension - Might take you up on a fish once I start getting it worked out. but nothing beats having somebody who knows what they are doing instructing you in a park somewhere so they can pick up on mistakes and get rid of them early! Best advice I could give would be keep your wrist like a rock, and make sure you accelerate forward - stop. accelerate back - stop. And watch your loops religiously until you have a "feel" for when they will be unfurled. And initially, keep your casts relatively short (30-40ft) until you have that mastered and then you can start trying to get distance. For SW flyfishing, dont sweat the "presentation" too much, the fish aren't that fussy - in fact often the splash lets the fish zero in on your fly. You sound like you are in the sam eboat (pardon the REALLY bad pun - but come to think of it I wish I had a boat) as me. I have a 9wt outfit that I need to really start using and I am keen to get into some SWF. If and when you decide to give it a crack or just want to go to an oval or the beach to have a few practice casts let me know, I would be keen to join you. Perhaps together we can crack this nut. No Problem Gus. Could be funny with a couple of beginners and a few beers. Thanks for the Youtube vids Huggy. Was very informative. Just got to remember not to use the wrist. I wish I was over there with you for this date. ( 2 more months to go ) Sounds like SWF is a lot more forgiving than fresh re casting! Stuff up a presentation to a brown trout & thats it "he`s outa there!" Catcha later when you can show me a few tricks! I've been swoffing a bit for a couple of years but am certainly no expert, taught myself from books, but you'll definitely get it faster and better if you drop into Oceanside or somewhere for some pointers or tuition. i got an 8/9wt size, so that i could go for anything from tailor/flatties to tuna and mackeral. it is probably a bit big for the flathead - maybe i'd go for 6 or 7 or 8 wt, but ive found it pretty decent for your medium sized all-rounder rig - i've caught things from tailor to 5-10kg trevs and tuna. The trevs and tuna thrashed me but were definitely land-able - pain = fun when fly-fishing i reckon!!! i think it is a perfect size for salmon. I havent yet been compelled to get a different sized rig - but i dont really specialise in my fishing. the holy grail for me is a spaniard on this 8/9wt rig...that will really test me and the rig i reckon...!! THIS YEAR!! experts will catch more fish on their fly set-up than anyone else will - i am not there yet and almost always get outfished! !, but i find it so much fun because you are so much more involved in the fishing process...it is a challenge to cast it right, to tie on the right fly, and to strip it the way the fish like it - it is usually really visual too which is pretty exciting. and then the fight is pretty interesting when you are tyring to get in a fish on a noodle!!! it is a whole differerent kettle of fish (pun pun pun) which is why i love it!! I hope you have fun! it is a good time to fish the Swan River flats, which are also a good place to practice. careful you dont take an ear off!! Those videos are really good even for an old hand ( pardon the pun) I was tending to drop the delivery cast below the falsies which is a bad habit! I broke off last 4 inches of my graphite in the car window when trying to get some shuteye 10 years ago. It is a seikipro legendplus 6--7#. I have just about forgiven myself & the mozzies that instigated the move so will be looking to replace it after I move. Any good deals in Busso or Bunbury? Will keep the old rod, line & reel for learning SW. Fly fishing is really cool. With yesterday awesome weather i thought i'd get out there and give the FAD dollys a nudge on fly. KC (Kasey) came out for the trip and zipping out at a lazy 30 knots was sweet. Ended up fishing the Yamaha FAD first where i bumbed into Ozlobster (John) and HLOKK (Matt). Seemed the boys were already into the fish on artificial as i rocked up and was great to see some fish about! 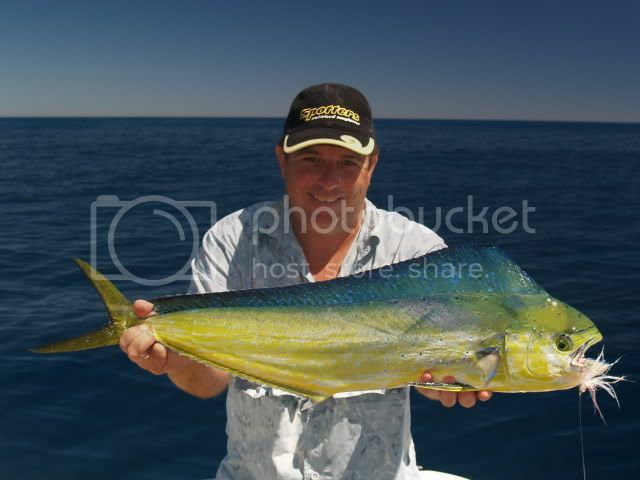 Size was down for this time of year but I ended up knocking over atleast 4 Dolphinfish on fly. I kept a few and released the rest with my hand tied pink/white epoxy head deceiver Fly doing the damage. Kasey worked poppers and stickbaits with a few dollys falling to the artificial offerings and his Dolly "First's" coming onboard. A few pics, they turned out sweet...cheers KC! * Hooked up on my 8WT, geez they really are an awesome sportsfish on fly, plenty of aerials! Awesome fish Ryan. Great weather for it. Cheers Gus, was better than expected (always a first) and made for a quick trip to & from! sounds like a good trip, with some good weather as well. The Tackle shack, for all your fishing needs. 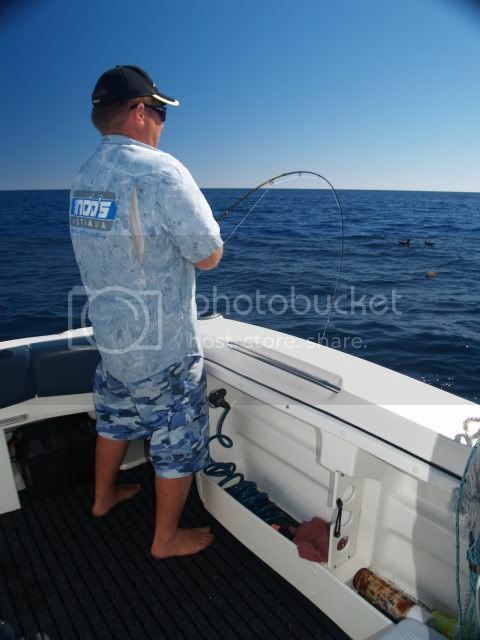 The trip was great Blake, originally i was going to do the FADS then some deepwater fishing. The FADS were producing and that took up most of the day, had a quick look around in the deepwater at a few marks but not much happening so back to the FADS....more fun! I'm using the polariser & flash to get those good pics.....works well mate! im pretty dumb when it comes to cameras but im presuming thats from a DSLR? Any signs of bigger size ones out there yet? Yeh spot on, the polariser lens gets the colours showing but dulls the picture as it takes out glare/light. That's why i use flash to re-enhance it and the picture looks good....still need to take a good picture howeverl! I went to a few FADS that day and some had zip whilst the PGFC FAD had the biigger dollys but spooky from the previous day i reckon. The numbers were down but it'll get better........roll on!